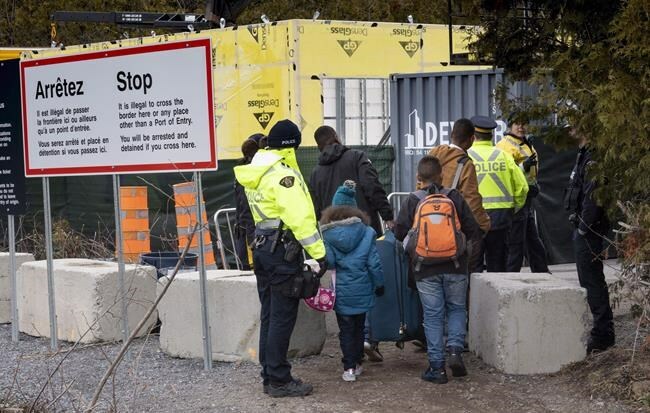 OTTAWA — Asylum-seekers who entered Canada irregularly last year will cost federal organizations $340 million — an amount projected to balloon to almost $400 million for migrants who arrive in 2019, the federal budget watchdog says. A report Thursday from the parliamentary budget officer calculates the average cost of each irregular migrant who arrived in Canada between April 2017 and March 2018 at $14,321. The actual amounts vary depending on how long asylum seekers wait for their refugee claims to be finalized, budget officer Yves Giroux wrote in his report. Claimants accepted at their first hearings cost the federal government less; those who exhaust all legal avenues and are eventually removed from Canada cost more. The PBO projects that costs per migrant will rise to $16,666 in the fiscal year ending March 2020 because of longer wait times for migrants waiting to complete the entire asylum-claim process, which will mean the federal government will be responsible for their health care for longer. Giroux warned that $340 million or more could become an annual cost if Canada doesn't see any decrease in the number of irregular asylum-seekers. Canada has experienced an influx of irregular migrants through the border with the United States since early 2017, shortly after the Trump administration took steps to end temporary protected status for tens of thousands of migrants living in the U.S. Since then, almost 35,000 asylum seekers have filed refugee claims at the Immigration and Refugee Board, Canada's arm's-length agency that deals with refugee claims and appeals. A quirk in Canada's laws means that if someone makes an asylum claim on Canadian soil, Canada has to evaluate it. The same claim made at an official crossing from the United States would be rejected on the spot. Many claimants have avoided official border checkpoints where they would have been turned back to the U.S. under an agreement that defines the United States as a country where refugees can safely stay. The PBO says this influx of irregular migrants has placed "significant pressure" on federal resources, leading to major delays in processing times for refugee claims. Last year, the Immigration and Refugee Board had the capacity to handle 24,000 claims but got more than 52,000 — half of which were from irregular migrants. The federal government promised $173 million over two years to address rising costs, but Giroux said the growing backlog of claims shows that's not enough money. "It's a bit like shooting yourself in the foot to underfund the IRB and other government agencies, because these kinds of savings end up increasing federal costs. So the savings, in terms of claims processing, end up costing more," he told reporters in French. Border Services Minister Bill Blair said the government has increased spending to deal with border crossers, but has also been streamlining the claims system to keep costs low. "Our first obligation is to ensure that all of our processes are as efficient as we can make them," he said. "We've been managing it within existing resources, and where additional resources are required, we'll come forward with that information. But I think our first obligation is to make sure that we're doing it efficiently, that we're doing it at the lowest cost possible while upholding our legal obligations." Conservative immigration critic Michelle Rempel has been calling on the Liberals to close the loophole that forces Canadian authorities to process refugee claims from people who are already across the border. She blamed Prime Minister Justin Trudeau for causing the sudden increase when he welcomed fleeing migrants to Canada in response to U.S. President Donald Trump's crackdown on immigrants, in a 2017 tweet. "It just blows my mind that between 2017 through next fiscal year, this prime minister is choosing to spend $1.1 billion on essentially what amounts to the abuse of our asylum system. Some of the numbers in here are absolutely shocking," Rempel said in response to the PBO report. Blair called it "silly" to suggest a tweet sparked it all, when the United Nations has said the number of displaced people in the world fleeing persecution and violence has reached record highs. However, Blair did acknowledge that "certain aspects" of the Safe Third Country Agreement have been "providing an incentive to individuals to cross irregularly." He has been in discussions with the U.S. Department of Homeland Security over possible changes to the agreement to address this, he said. "Right now, if people go to a regular point of entry, there are certain outcomes determined by that agreement. That is not in effect in other parts of our border. And so there are ongoing discussions with the United States on how, to our mutual benefit, that could perhaps be made more effective." The budget officer's report only dealt with federal-government costs; provinces and municipal governments cover some, too, including welfare payments while refugee claimants aren't allowed to work. Ontario has pegged its provincial costs for dealing with irregular migrants at $200 million. Quebec did not provide the PBO with its cost estimate, but Giroux said it likely faces similar financial pressures as Ontario. Giroux said federal figures suggest costs for provinces and territories are at least equal to those incurred by the federal government. — Follow @ReporterTeresa on Twitter.